How do you speed research in style? Host a sip and shop to stop Duchenne! One Thursday evening last December, supporters from across New York stepped in from the cold for a special evening of camaraderie and shopping to benefit Charley’s Fund. This “Sip + Shop” was held at Liana Boutique, an Upper West Side institution for stylish attire — and excellent personally tailored fashion advice. Liana generously donated a portion of sales made that night and the following day to Charley’s Fund to help speed research for Duchenne treatments. After all was said and done — and all our supporters were dressed to the nines! — the Sip + Shop raised more than $3,500 for Charley’s Fund’s mission! Behind this fantastic event was longtime supporter and Charley’s Fund board member Ellen Wilner. We caught up with Ellen to chat about the Sip + Shop, how she turned one of her favorite Upper West Side storefronts into a win for research progress, and what she’d say to anyone inspired to do the same. Question: First of all, thank you for putting together such a wonderful and successful event! Can you tell us a little bit about how this event ‘came to life’? How did the idea originate? Answer: Of course! It was my pleasure to introduce another event and fundraising opportunity into the Charley’s Fund line-up. I’ve shopped at the wonderful Liana Boutique on the Upper West Side for years and have become friendly with the owner, Liana Pai. Liana had heard me speak about the work I do with Charley’s Fund and asked if there was something we could do together. That is how the “Sip + Shop” was born. From there we reached out to Charley’s Fund who helped us work through some ideas, provide guidance, and set up a wonderful event page. Q: What a great partnership! Can you tell us a little bit more about the ‘Sip + Shop’ fundraiser? A: One Thursday evening, Liana extended the regular store hours, provided wine and snacks, worked her fabulous styling magic, and most importantly, generously donated 15% of all sales made that night to Charley’s Fund. To add to her kindness, she also donated 15% of sales from anyone who shopped the following Friday (and even a few days in advance) and mentioned Charley’s Fund. To increase excitement for the event, we held a spectacular raffle at the event for a basket of beautiful items secured by Liana from her vendors. To enter the raffle, participants could RSVP on the event page Charley’s Fund created, make a purchase, or, for those who couldn’t attend or just wanted to “up their odds”, donate to Charley’s Fund. The evening lasted over three hours, there were lots of laughs (and purchases!) and we’ve already had requests to do it again. Q: When putting on a fundraiser, or any kind of event for that matter, one of the most common worries is “are people going to come?” You had great attendance. How did you do it? A: Well there is always that worry no matter what you plan. I am lucky to have wonderful friends and family who are loyal supporters of Charley’s Fund. I sent personal invitations to my crew, Charley’s Fund shared invitations with its local supporters, and Liana sent invitations to her loyal shoppers. It was great to learn that many of my friends already were Liana shoppers, and that a number of Liana shoppers already were Charley’s Fund supporters! Don’t be afraid to invite people and encourage them to spread the word. You never know what event or idea will strike someone’s fancy and the more people we introduce to Charleys’ Fund, the better. If we spark interest in just one new person per event, that’s a home run! Q: This event was SO successful – people had a blast, it exceeded fundraising expectations, and already there are requests for a follow-up event. What do you think it was that led to such great outcomes? A: It was the teamwork of Liana, Charley’s Fund and myself that made it such a great event. Liana is an amazing community supporter whom people know and love, and Charley’s Fund was there to help guide and provide backup to help get things done. Liana can style and outfit people like nobody’s business and Charley’s Fund knows how to plan and execute events. In return, our friends and supporters responded by turning out and bringing the positive energy that Charley’s Fund events are known for. All of that combined created a wonderful event. Q: It’s really great to see a supporter organize a fundraiser from soup to nuts. What advice would you give to anyone who’s considering doing the same? Or even someone who hasn’t thought about it yet! A: Don’t be overwhelmed. If you have an idea, Charley’s Fund can help make it work. If you supply the idea (which doesn’t have to be totally fleshed out), the connections, enthusiasm, and drive to make it happen, Charley’s Fund will help you make it happen! Don’t think it has to be complicated. It is often the simple fundraisers that have the biggest impact. There are many people and businesses willing to help… you just have to ask. When you believe so strongly in something like Charley’s Fund, it is easy to ask. 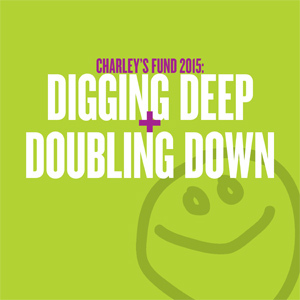 So, don’t hesitate to bounce any and all ideas off the Charley’s Fund team – no matter how big or small. They are there to help.